The severe drought that has stricken Texas for the past year has affected more than just farmers and ranchers. Hunters and outdoorsmen will find this fall radically different than last year. Hog Blog author Phillip Loughlin is moving to Texas from California (congrats Phillip! Texas welcomes you!) and has been searching for suitable property in Central Texas. Much to his dismay, all of the land in this part of the state is looking incredibly parched and dry right now. Even the invasive (and resilient) cedars are beginning to look dry and crispy from the oppressive heat and lack of rainfall. The trick is to make my little place more attractive than the places around me. I’ll need to develop water sources and food. How much does it cost to maintain a few feeders, and how many do I really need on a relatively small (100-200 acre) property? Will I need an extra well to supply wildlife water? 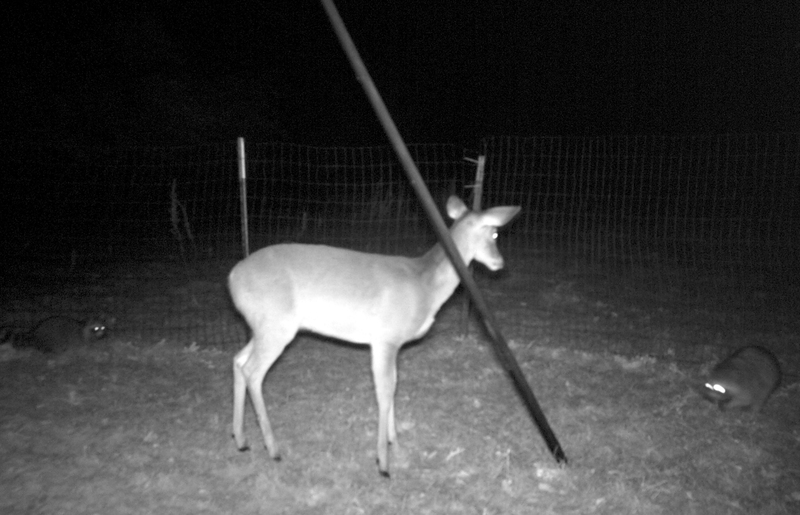 Encounters such as this are becoming more and more frequent around the corn feeder as wild game are concentrated into the small areas where food and water can be found. Mr. Loughlin probably already knows this, but I’ll lay it out for other readers: hunting medium and large game in drought conditions is actually fairly easy. You simply need a water source. Most rural Texas properties are dotted with stock tanks, small ponds of water used to keep cattle hydrated. Some are fed by wells, but most are naturally filled by seasonal creeks, streams, or simply by rainfall runoff from nearby fields. Once established, especially during drought conditions, a water and food source such as this can continue to encourage wild game to become permanent visitors, if not residents, on even small properties of just a couple of hundred acres. Dense cover nearby will naturally encourage deer, hogs, and other critters to frequent the area. If there is no natural water on the property, and stock tanks are dry or non-existent, it’s not difficult to set up a simple water source. Deer and hogs have an acute sense of smell and can locate water sources from miles away. By simply setting up a trough and automatic-waterer, you can soon establish a reliable water source for wild game. For truly primitive properties, this may mean drilling a well and installing some water lines, but if there is already water and power service to the land you don’t necessarily need a second well to keep your water source full. It’s not terribly difficult to bury a 1/2″ PVC line out to the trough from the same pump that supplies the residence. In Texas, where baiting is legal, locating game becomes even easier. Most deer and hog hunters in Texas use corn and high-protein feeders set on a timer to dispense feed once or twice a day. To hunters in other states where baiting is illegal, this seems anathema to the ethical hunter but, as any Texas hunter will tell you, knowing where the deer or hogs might be is no guarantee of a successful hunt. Still, if you’ve got a feeder set up, with forbs and mast crops in short supply, it’s a much better bet this year that you’ll see some activity. Rising corn prices means that it’s going to cost a bit more this year for hunters to to keep the feeders full. Current prices have deer corn hovering around $15-$20 for a 40 pound bag, and those prices are expected to go up even more. Between searing droughts in the south and middle of the states, and drenching floods to the north, the US corn harvest is looking pretty grim. Pick up your corn now before the hunting season begins in earnest and you’ll save a bit of cash. This fall, deer and hogs will be concentrated in a manner not often seen by hunters. Find the water or food source, set up your blind there, and you’re almost guaranteed success. Deer will be smaller, and bucks will have smaller racks relative to years past, but they will be easier to locate. Scout out the water and food sources on your hunting property, and you’re sure to see activity of all sorts. Unless this fall brings tropical rains, and soon, the deer and hogs will continue to frequent these locations as the season gets underway. This post is supported by the Texas Hunters Safety Education Course. Take and pass the required Hunter Education class online from the comfort of your own home.